So awhile ago, on the Instagram story, there was a poll on this book with the options of simply, yes, I loved it, no, I didn't like it. The majority of responses were that readers loved it, however there was a large chunk around 35% of you who responded you didn't like the book, which is actually larger than I expected. Since then, I've now finished the book and here are my thoughts on it! I hope you enjoy, but also let me know if you liked the book, why, if you didn't, why, and any other opinions! 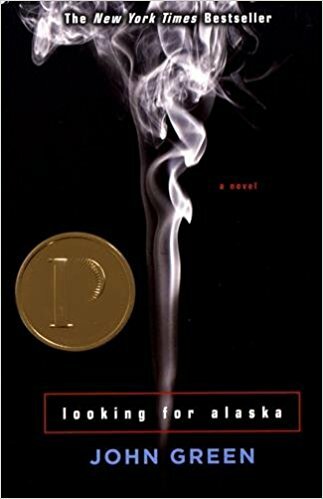 First off, I knew Looking For Alaska would be the story of 136 days before and 136 days of after because John Green is much too clever and purposeful to NOT do such a thing. Everything was slow and I didn't like any of the characters except for Takumi. I think everything was meant to be slow. It's a purposeful kind of pace. Not every story has to have raging, high speed chases and somebody's mob death taking place in an Italian restaurant. Not every story has to have some huge shocker at the end. And that's something I really appreciate about LFA. Even though it wasn't my preferred pace and this book took me longer to get through than most this book still has a lot to offer when it comes to thoughts on life and death and the value we find in each of those departments. Something I did not like was the language. In TFIOS John Green really blew me away with how real he could make a character through their dialogue, but in this one, some parts of it were lazy and unattractive. That was a little much. And maybe that has to do with the times between when this book was written to now? But that's kind of stretching it. Beyond that, I just didn't like Pudge very much. He was very stubborn to realizing his character flaws, especially his selfishness, and even though that hurt my overall experience with this book--like I really did not enjoy reading through his POV and the way he handled MOST situations--I still appreciate this book as a valuable text on identity and our interactions with our environment. Also Alaska was a little much. Perhaps at the time this was written, to have a girl in a Teen book who was so enigmatic she just "enchanted" everyone around her, pulling people in to always inquiring what was going on in that head of hers, perhaps this was a grand, unheard of idea. But past the romanticization of a beautiful girl also being part smart, part edgy, part vulnerable, Alaska wasn't much of a person who had a lot to fall in love with. And that's a large reason why I couldn't get on the train that was so desperately looking for her. The most valuable part of the book to me was the last several pages where in the span of this school year, Pudge had become a better person. Through a written response to everything that had happened, we see the way he's grown from the beginning day of coming to Culver Creek to the ending of his junior year. He has a great perspective on life and Finding the Great Perhaps and I really enjoyed that part! Even if I didn't like his early moments, I still know those were necessary for him to get to the great moment of the last pages. I will still include my favorite quote, written below! maybe the afterlife is just something we made up to ease the pain of loss, to make our time in the labyrinth bearable... ultimately she was not only matter. .. we are greater than the sum of our parts...we are as indestructible as we believe ourselves to be... (teenagers) are not born ad we cannot die. Like all energy, we can only change shapes and sizes and manifestations. They forget that when they get old. They get scared of losing and failing. But that part of us greater than the sum of our parts cannot begin and cannot end, and so it cannot fail. Thomas Edison's last words were "It's very beautiful over there." I don't know where there is, but I believe it's somewhere, and I hope it's beautiful."